I am with you on this. It would not only make a good use out of the I-97 number, but also provide an alternative to the Capital Beltway that is already congested. Plus, it would be an outer beltway of DC (or at least a half beltway) just like I-495 is for Boston, MA. I suggested it before years ago on another thread, as I was inspired by another road site that listed the cancelled proposal of another east side beltway around DC and another Potomac crossing. I always thought anyhow that a new I-95 alignment with a bridge south of Mount Vernon should have been built instead of the Woodrow Wilson Bridge replacement, as most of that crossing's traffic is through I-95 traffic. An I-97 extension would work just as well if it were extended along US 301 and VA 207 to tie in with I-95 at Ruther Glen, VA, or even connect it with I-295 NE of Richmond and even renumber the eastern leg of I-295 to I-97 and have it continue along I-295 to end south of Petersburg making it a three city bypass and an interstate that is much longer than I-12 in Louisiana. It's a good idea. Though, I was always a fan of having I-97 go east from Annapolis then follow US 50 to Salisbury to connect with US 13; then from there head south to Norfolk where it would then follow US 17 to Wilmington. But an alternate around Washington is good too. It would not only make a good use out of the I-97 number, but also provide an alternative to the Capital Beltway that is already congested. The southeast side of the Beltway is not all that congested. Not even close to the congestion level of the north and west sides, which an I-97 route would *NOT* help. I always thought anyhow that a new I-95 alignment with a bridge south of Mount Vernon should have been built instead of the Woodrow Wilson Bridge replacement, as most of that crossing's traffic is through I-95 traffic. Ummmmm...no. The vast majority of Woodrow Wilson Bridge traffic is DC-area traffic or traffic that has an origin or destination within DC. At best, there is about 30,000 vpd of "through traffic" on I-95. Per VDOT traffic figures, Wilson Bridge daily traffic is 150,000. That's 20%, not even close to "most". Furthermore, where would you put such a bridge? Even in the 1970s when I-95 was cancelled through DC and rerouted onto the Beltway, development was to the point where you couldn't put a bridge anywhere north of Mason Neck (and if you thought the "Bi-County Parkway" folks were screaming about that road right now, Mason Neck residents would go on a murdering rampage if you were to even think of putting a bridge on Mason Neck). We're to the point now where there's no way you could put a bridge upriver of about Stafford. Best bet is just to replace the Nice Bridge and work on incremental improvements to US 301. As nice as a freeway route along 301 would be, I just don't see it happening anytime soon. IMO, that part of the Capital Beltway is "on the edge" of getting much worse, probably due to population growth in places in Calvert, Charles and Anne Arundel Counties (and in Northern Virginia). Population in Prince George's County has not changed much in recent years. Within the D.C. metropolitan area, yes. Though I have seen how (mismanaged) incidents on the Southeast/Southwest Freeway in D.C. during the morning peak commute period have backed-up all the way down I-295 and onto the Wilson Bridge (before and after the Wilson Bridge widening project was completed). 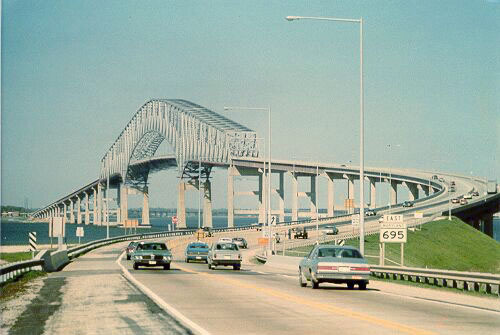 2011 AADT for the Wilson Bridge (according to the Maryland Highway Location Reference) was 197,460. I recall one proposed crossing was near MCB Quantico and Triangle, Virginia (in other words, north of the Town of Quantico) and Chicamuxen, Charles County, Maryland (south of the U.S. Navy reservation at Indian Head). There is a massive 500 kVa electric transmission line that crosses the Potomac near here (it crosses the river at an angle such that the Virginia end of the crossing (near Dominion Virginia Power's Possum Point electric generating station) is further north than the landing on the Maryland side). The pylons holding the line up are clearly visible on Google Maps (here). To be fair, it's been over a year since I did the Outer Loop morning commute. But my experience is that it's VERY RARE for that traffic stream to back up onto the Wilson Bridge proper. IMO, the VDOT number is probably closer to the reality. But a higher number just proves my point more, that "through I-95 traffic" is even lower of a percentage of the overall traffic. A useful number for comparison is the traffic count in the segment of I-95 NB just north of VA 207 (43000), which would primarily be through traffic using I-95 to/through the DC area. Of course, a chunk of this through traffic would be heading for I-270 instead of the Wilson Bridge. Interestingly, the aadt for I-95 NB just before VA 207 is 46000, so only a modest amount of traffic is doing the VA 207 to US 301 to Maryland through route. mainline I-95 NB traffic data just before the beltway is 118000. I-395 NB traffic data just after the beltway is 77000. Most of this would be coming from I-95 NB, leaving 40000 or so to split between the directions on the beltway from I-95 NB traffic (ramp aadt not available on the 2011 VDOT report). My sense from doing 15 years of DC area commutes is that the majority of traffic is not through-traffic except Fri/Mon around major holidays. Agreed that it has been rare, since it takes a severe incident (or a badly mismanaged incident) to get I-295 traffic backed up all the way from the 11th Street Bridge, S.E. to the Wilson Bridge. Though I wonder if it will become more common when the Coast Guard and other parts of DHS start to move into their new office complex on the old St. Elizabeth's Hospital site across I-295 from Joint Base Anacostia Bolling? I suspect that a lot of those jobs are held by residents of Northern Virginia. During the 1990's EIS process, I think I recall reading someplace that 80% of the auto traffic had at least one trip end within 10 miles of the bridge. I seem to recall a report sometime after I'd transferred to DC that the I-95 "through movements" at the Springfield Interchange had roughly 40,000 vpd (combined for both directions). This would've been 2009 or early 2010. Can't imagine it's changed much, given the recession and the Telegraph Rd construction that has just now finished. Though if we discuss truck traffic separately, then the percent of through traffic running in the I-95 corridor (and alternates, such as Va. 207, U.S. 301 and Md. 5) is pretty high. Quite possibly over 50% of truck traffic - that also depends on the time of day and the day of the week. Agreed. Though remember that the two-lane capacity of the current Gov. Harry Nice Bridge will tend to constrain traffic to some extent (as do the signalized intersections in LaPlata, Waldorf and Brandywine, all of which have capacity issues that become obvious if a lot of I-95 bailout traffic heads for U.S. 301). if i were to design the bridge, i would base it off the way they built the Key bridge around baltimore, keep the two lane approaches, but have the approaches curve upto the main span, to allow for a proper freeway connection in the near future, i know the original reasoning for the approaches being that way was due to reusing ROW for a tunnel, but i think it would work for allowing future expansion of the road. Now the question is, how many of those 40,000 vpd are destined for points in the Washington DC area? Either from Baltimore and north to points along I-95 in Fairfax and Prince William Counties, or points along I-95 and the east side of the Beltway to points south of Stafford on I-95. That traffic would be using the through movement at Springfield, but is not through traffic that would be helped by an outer Beltway/301 bypass. If you take the actual number of through vehicles that traverse I-95 from Stafford and points south to Columbia and points north, my guess is that it would be quite a bit smaller than 40,000. If you take the actual number of through vehicles that traverse I-95 from Stafford and points south to Columbia and points north, my guess is that it would be quite a bit smaller than 40,000. This is the number that I was estimating earlier could be no higher than 30,000. Perhaps somewhat higher on long summer weekends, but even on those weekends, a lot of the I-95 crush is traffic going to/from Prince William County (Woodbridge/Potomac Mills/Dale City area in particular). The draft version of the state’s six-year transportation plan includes $6 million for preliminary engineering work on a replacement for the Gov. Harry W. Nice Memorial Bridge, a high-ranking transportation official wrote to Sen. Thomas “Mac” Middleton two weeks ago. In a June 27 letter to Middleton, Maryland Transportation Authority Acting Executive Secretary Bruce Gartner wrote that the draft Consolidated Transportation Plan includes $6 million for preliminary engineering, boring and geotechnical work, as well as ordnance detection and pile testing near the replacement’s approved location, to the immediate north of the current span. The country’s economy was struggling, jobs were scarce and a transportation route south of Maryland across the Potomac River was needed. The Potomac River Bridge, now known as the Gov. Harry W. Nice Memorial Bridge, was built for $5 million, $79.7 million in 2013 dollars, based on federal Consumer Price Index average inflation of 3.76 percent. But why was the bridge renamed in 1968 for a lawyer who was born in Washington, D.C., grew up in Baltimore, and became governor of Maryland in 1934? I agree with the idea of extending Interstate 97 down to I-95 in Ruther Glen or take over the eastern I-295. I'd love to see the Nice Memorial Bridge rebuilt as a suspension bridge. http://en.wikipedia.org/wiki/Governor_Harry_W._Nice_Memorial_Bridge Here is a wiki article about the future plans for the Nice Bridge that will be fout lanes and have pedestrian and bicycle lanes. Agreed, I think that I-97 should not only be extended for sake of through I-95 motorists, but for the whole US 301 corridor from Bowie to the current Nice Bridge. It seems to me that 301 has built up plenty especially around Waldorf and South of LaPlata. Sprawl has taken over and changed a rural highway into an arterial like elsewhere around the Metro DC area. When I was there in 97, I remember added signals along US 301 south of MD 6 that were not there in 1980. Plus you have had MD 5 realigned to bypass Waldorf because of it and putting a freeway south of Annapolis to Richmond or at least Ruther Glen would relieve local congestion in two places not just one. Many experts even forget that some folks will travel hundreds of miles out of the way to avoid DC by taking I-78 to I-81 and back to I-95 via I-64 or even take US 15 as an alternate as well. We do not know for sure how many people do this, but it would add to the traffic counts through the Springfield Interchange that is not counted as of now. Not enough....the number is small enough to where it'd be considered a rounding error when compared to the Springfield Interchange volumes. 2013-11-25: Maryland Transportation (Toll) Authority (MdTA) has approved the next move on the long slow journey to a replacement of a bridge built in the term of one Governor Harry Nice. They have committed some $56m over five years to buying the right-of-way and getting design work done. There’s no commitment to actual construction yet. Interestingly, there is no indication of where and how the toll plaza will be situated on the Maryland side, which suggests a strong commitment to open road tolling and a relatively low provision of toll booths. The environmental documents suggest all-electronic tolling, probably in both directions. MdTA is advertising a contract for subsurface boring and samples. Looks like the old Harry Nice Memorial Bridge is going to be around for a while yet, since MdTA has posted an Invitation to Bid for repair work for that old structure, including a new catwalk under the bridge. The U.S. Coast Guard and the Maryland Transportation Authority are seeking information and comments from boaters and property owners on the planned replacement of the Harry Nice Memorial Bridge. The Maryland Transportation Authority recently started preliminary engineering work on the project that will replace the two-lane bridge over the Potomac River between the Dahlgren area of King George County and Maryland. The bridge is 75 years old and functionally obsolete. The Coast Guard is asking residents to fill out a “Mariner Survey” form to help determine the proper horizontal and vertical clearances needed for the new bridge. Officials also are seeking views from waterfront property owners and mariners on their support or opposition to the project.